Using a slow cooker to prepare meals not only helps you save time on total meal preparation but requires less energy as well. Simply combine all the ingredients and let it cook while you run errands or engage yourself in other activities. By the time you are back, you will have a delicious pot of food ready to eat, without much mess or dishes to clean. Sounds like magic, doesn’t it? Foods cooked in this way usually taste much better and have ample amounts of flavor due to the long cooking time. Additionally, by controlling the ingredients added, you can significantly improve the nutrient content of your meals. The extended cooking time results in better distribution of flavors. Less expensive or tough meats including roast or chuck steaks can be tenderized during the long cooking process. This makes slow cookers an excellent choice for preparing venison dishes. Consequently, the long cooking time retains the natural juices from meats and vegetables, resulting in a flavor-packed, nutritious meal. Also, the low temperature used to prepare meals will lessen the chances of scorching of foods that tend to stick to the bottom of the pan when using an oven, so you need not worry about coming home to a burnt meal ever again. A slow cooker is a blessing in disguise for folks who do not have much time to cook. Simply follow the recipe and add all the ingredients. The slow cooker can be left unattended all day long while you go to work or run errands. By the time you come home, there will be a fresh pot of stew for you, ready to be served. Hence, you need not slave over a pot for hours. The initial prep is all you have to worry about. When using a slow cooker, you need not dread scrubbing several pots and pans. Depending on the recipe, you will only have to wash the slow cooker and a few prep utensils. This saves time and energy that you can utilize in more productive tasks. 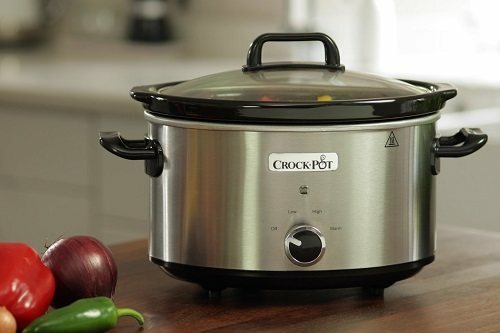 By investing in a slow cooker, you can reduce your consumption of processed foods. Frozen and canned meals, such as baked desserts, roasts and casseroles, which you usually buy from the store, can be prepared at home without much trouble. Simple browse the internet for slow cooker recipes and you will marvel at all the choices you have. Additionally, you need not add too much oil in the slow cooker just as long as there is enough moisture. You may also trim the fat off the meat or else you will find pools of oil in your stew as the fat usually drains away when you are frying meat. This does not happen in a slow cooker, hence trim off the fat and enjoy a healthier meal that is still tasty. 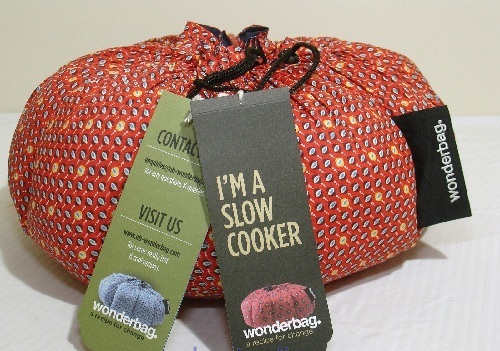 Slow cookers are available in various sizes and usually travel well. Simply pack it up inside a box to take to a party or to your friend’s house for a small gathering. The best part is you do not have to worry about carrying too many utensils. The slow cooker is a splendid choice for holiday meals and large gatherings as it frees you from the oven. Slow cookers eliminate the need to cook in front of a scorching hot oven all day long. This increases comfort and makes cooking a more pleasant activity, especially during the summers. Slow cooker recipes have recently made a comeback and are gaining popularity. Whether it is the time saving element or the fact these recipes require minimal labor, people cannot seem to get enough of the slow cooker craze. Luckily for you, we have an incredible line-up of scrumptious recipes you need to try. Breakfast is the most important meal of the day so why should you start your morning with a boring piece of toast. 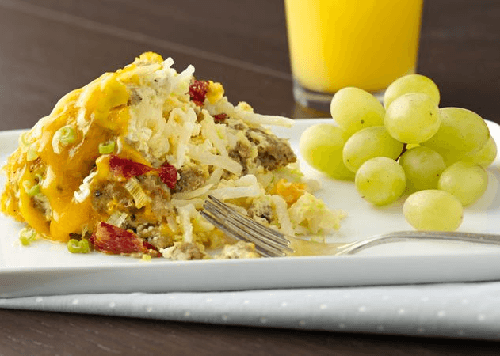 Here is a list of scrumptious slow cooker breakfast recipes you need to try. Happy Cooking! 1. Use a 4 to 5-quart slow cooker and line the sides using a foil that has been folded into thirds. Use cooking spray to spray over the foil. 2. In a medium sized bowl, beat eggs and combine the pepper flakes, salt and pepper and half-and-half. Whisk well. 3. Reserve 2 tbsp. of green onions and ¾ cups of cheddar cheese. Set aside. In another bowl, stir together the remaining cheeses. 4. In the slow cooker, layer the remaining green onions, half of the cheese, sausage, roasted peppers and potatoes. Repeat the layers while pouring egg mixture over it. 5. Allow the pot to cook for 4 to 5 hours on low heat setting or for 2½ to 3 hours on high heat setting. 6. Sprinkle the reserved green onions and cheese on top of the casserole. Cover and let it cook for 10 minutes until the cheese has melted. 7. Remove foil before serving using a table knife. Powdered sugar, salted caramel or maple syrup topped, as desired. 1. Spread bread cubes over a large cookie sheet. Heat oven to 300°F and bake 20 to 30 minutes or until the bread cubes are completely dry. 2. Prepare a 4 to 5-quart slow cooker, lining the sides with foil that has been folded into thirds. Use cooking spray to spray over the foil. 3. 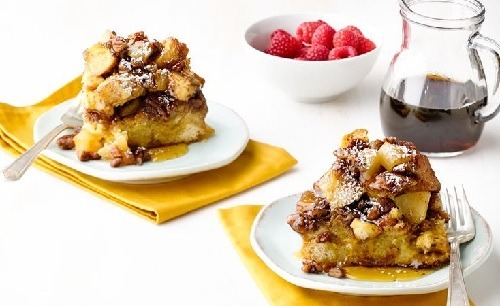 In a large bowl, combine all the French toast ingredients and beat well. Fold in the bread cubes and coat. 4. Let the bread cubes rest for 15 minutes, folding occasionally. 5. In an 8-inch skillet, melt 2 tbsp. of butter. Combine the apples and cook for 5 minutes, stirring occasionally. Meanwhile, in another bowl, combine remaining 6 tbsp. of butter along with the remaining apple-pecan filling ingredients. Stir together until the mixture is crumbly. 6. Spoon ½ of the bread mixture (amounting to about 4 cups) into the slow cooker. Toss in half of the apples and sprinkle half of the brown sugar mixture. Repeat layers. 7. Cover and let it cook for 2½ to 3 hours on low setting heat. 8. Discard the foil, using a table knife. 9. Serve the dish warm, topping it up with powdered sugar and some maple syrup, as desired. Trying to cut down on the meat? 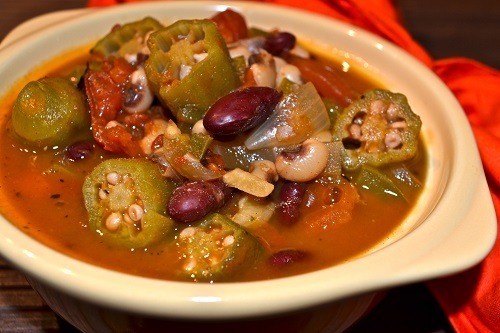 Well, luckily we have a list of delicious vegetarian slow cooker recipes that are easy to make. 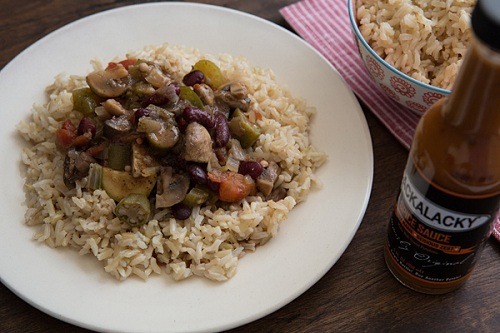 Who doesn’t like a steaming hot bowl of gumbo after a long day? We have the perfect recipe for you that is not only healthy but delicious as well. 2. Transfer the veggies into a 4-6 quart slow cooker. 4. Combine the broth and bring it to a boil and then transfer the mixture into a slow cooker. 5. Toss in the remaining ingredients in the slow cooker, all except for the cooked rice and hot sauce. 6. Cover the slow cooker and let it cook on low setting for 6-8 hours. Once the gumbo is cooked, discard the bay leaf and add more salt and pepper if required. 7. Serve the dish with rice and top it off with some hot sauce. 1. 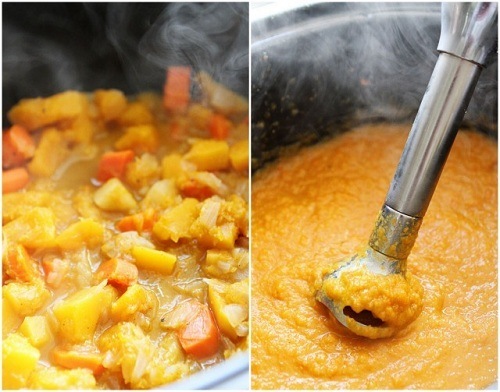 Combine the butternut squash, carrots, onions and apple to the slow cooker. Stir in vegetable broth over the ingredients. 2. Allow the vegetables to cook for 6 hours on low heat setting or 3½ to 4 hours on high heat setting. 3. Once the veggies are soft and tender, use an immersion blender to puree the soup. Combine the nutmeg, maple syrup and cinnamon. Season with salt and pepper. If you do not own an immersion blender, process the soup in batches in a regular blender. 4. Transfer the soup back into the slow cooker and top it up with maple syrup and season with spices. 5. Meanwhile, prepare the maple roasted chickpeas. Preheat oven to 375oF. 6. Wash and pat dry the chickpeas with a towel. Discard the skins by rolling them on the towel. 7. In a medium sized bowl, combine the maple syrup, cinnamon, salt and canola oil. Dry the chickpeas on a large baking sheet and drizzle the maple syrup on top until the chickpeas are well coated. 8. Bake in the oven for 40-45 minutes, stirring for every 15 minutes. 9. Remove from oven when crunchy. 10. Serve the chickpeas with a hot bowl of soup. 1. On a cutting board, dice the celery, onion and carrots. Rinse the potatoes well cut them into cubes (1-inch). 2. Toss the abovementioned veggies into a large slow cooker. 3. 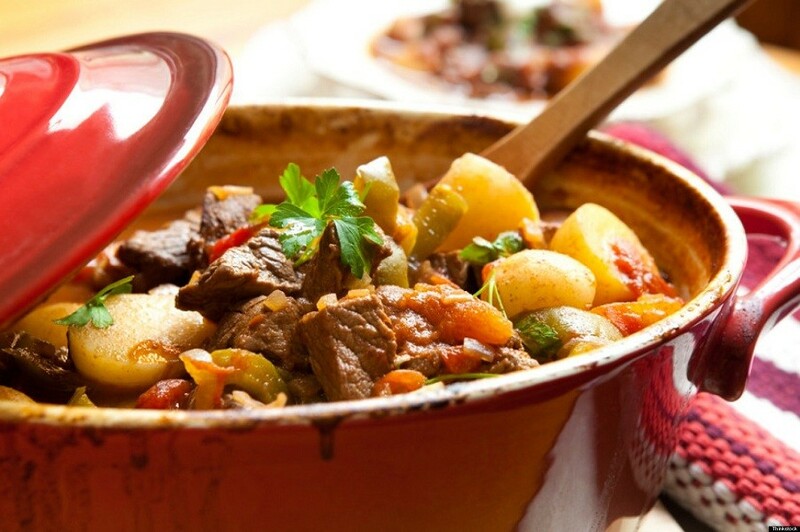 In a large bowl, place the stew meat and season it well with salt and pepper. Add the flour and toss the meat into the mixture until it is well coated. Set aside. 4. In a large heavy skillet, heat the olive oil over medium heat. Sauté the garlic in the hot oil for about a minute until it is tender and fragrant. Now add the floured meat and the flour on to the skillet, allowing the beet to cook for a few minutes without stirring. Flip it once it is brown on one side. Continue to do so until the meat is brown. 5. 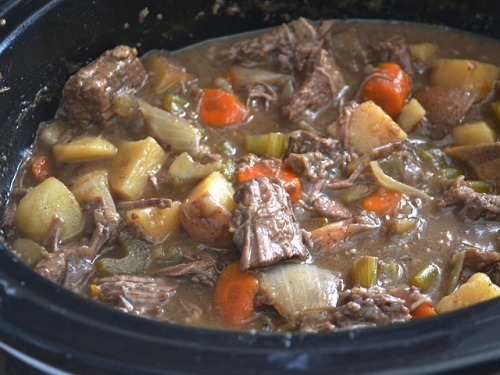 Combine the brown beef into the slow cooker and toss in the vegetables. 6. Place the skillet back to the burner, turning the heat down to low. Add the soy sauce, brown sugar, rosemary, Worcestershire sauce and thyme to the skillet. 7. Stir all the ingredients together until the brown bits have dissolved from the bottom of the skillet. Once everything has dissolved, pour the sauce over the ingredients in the slow cooker. The sauce will not necessarily be enough to cover all the ingredients but that is alright. As the beef cooks, more moisture will be released. 8. Place the lid on top of the slow cooker, allowing it to cook on high heat for 4 hours. Remove the lid and stir, to break the beef into smaller pieces. 9. Taste the stew and season it according to your tastes. 10. Serve over a bowl of boiled rice or paste. 1. Soak the beans in cold water for 8 hours or overnight. 2. Spray cooking spray on a 6-quart slow cooker. 3. Over medium heat, heat a 12-inch skillet. Toss in the bacon and allow it to cook until crispy and brown. 4. Use a slotted spoon to transfer the cooked bacon to slow cooker. 5. Season the pork shoulder using ¼ tsp. of salt and ¼ tsp. of pepper. 6. Increase the heat to medium high and cook pork for 3 minutes on each side until it has browned. 7. Transfer pork to slow cooker. 8. Season the chuck evenly with the remaining ¼ tsp. of salt and ¼ tsp. of pepper. 9. Transfer the ingredients to the skillet and let it cook for 3 minutes on each side until it is well browned. 10. Transfer it to the slow cooker. Reduce the heat to medium and add onions. Cook for about 4 minutes until the ingredients have softened. Add the garlic and cook for 1 minute. Transfer the ingredients to the slow cooker and combine well by stirring. 11. Drain the beans and add it into the slow cooker along with the broth and ham hock. Cover the mixture and allow it to cook on low heat setting for about 8 hours until the ingredients are tender. 12. Remove the ham hock and set it aside to cook cool. Once cool, remain the meat and shred it into small pieces and return to the slow cooker. Stir in the vinegar. 13. Meanwhile, remove the stalks and steams from the collard greens and wash thoroughly. Cut the leaves into 1-inch strips by stacking together several leaves and rolling them up together length wise. 14. Heat oil over the 12-inch over medium heat. Toss in 4 garlic cloves, allowing it to cook until it turns brown. Now, add the greens. Toss well so that all the ingredients have combined well. Cook for about 2 to 4 minutes until the leaves start to wilt. 15. Season with salt and pepper to taste. 16. 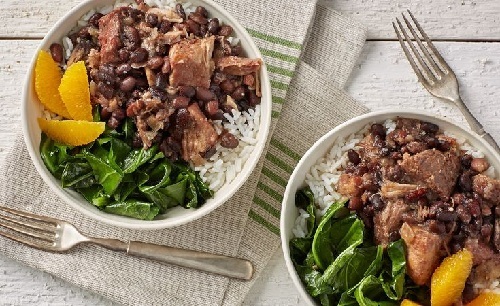 Serve the pork, beef and beans over a boil of piping hot rice along with the orange segments and collard greens. These tasty recipes are tempting enough for you to try them out immediately. So, what are you waiting for? Happy slow-cooking.